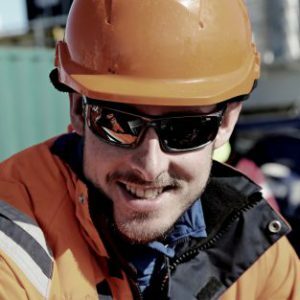 Mechanical engineer Carwyn Davies, from British Antarctic Survey’s Antarctic Marine Engineering (AME) is working onboard the RRS James Clark Ross with our science team to investigate Larsen C Benthos. Find out what it’s like to be part of the team looking after specialist underwater sampling systems. 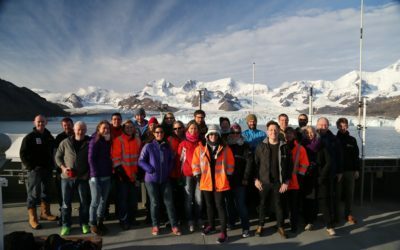 How does British Antarctic Survey’s Antarctic Marine Engineering team support science onboard our ships? 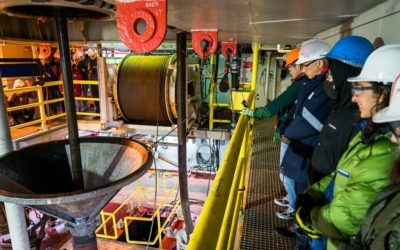 One of the roles of the Antarctic Marine Engineering team is to provide mechanical and electrical engineering support to scientific research cruises. 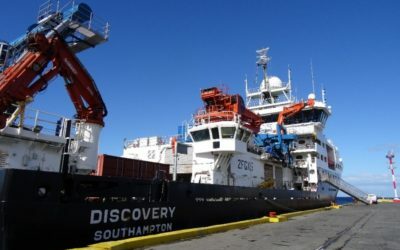 During these cruises, such as the Larsen C Benthos expedition, the team is responsible for deploying and maintaining the scientific equipment that samples and collects data on the environment and marine life in the study region. So, what sort of equipment is deployed? 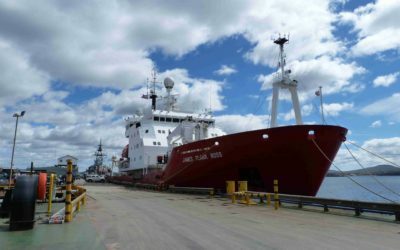 There is a wide range of equipment which can be deployed from the RRS James Clark Ross from water sampling, fishing for biomass in the water column with nets, to sampling the seabed and the marine life around it. 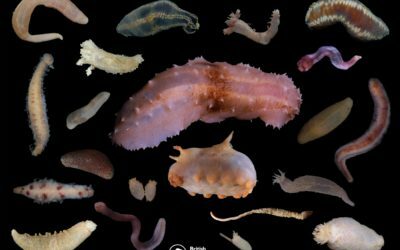 The primary focus for the Larsen C Benthos expedition is to examine the marine life living beneath an area previously covered by an ice shelf. In order to collect creatures living on the seabed we use a hydraulically powered gantry, known as the ‘A Frame’ to tow two different devices along the seafloor – the Agassiz trawl (AGT) and the Epibethic Sledge (EBS). Each of these, pulled by a powerful winch, is designed to collect differing size creatures. While the AGT is a very simple frame and coarse net, the EBS has nets as fine as 300 microns, and also carries an underwater camera system to enable more detailed analysis of the environment. 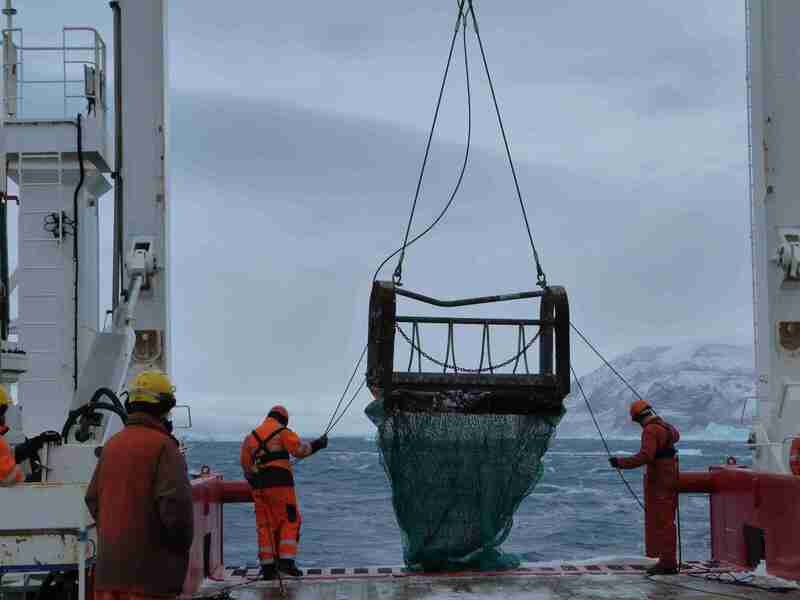 The Agassiz Trawl (AGT) being deployed from the RRS James Clark Ross near James Ross Island during the Larsen C Benthos scientific expedition. Photo credit: Rowan Whittle. Having recovered the nets from the sea floor, we have the Oktopus Multicorer (MUC) to deploy. This allows us to collect sediment cores from the seabed. 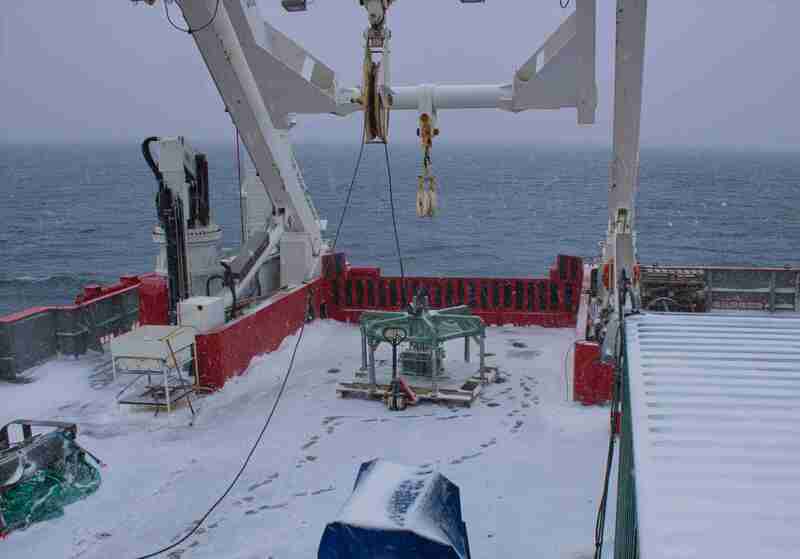 This rig is lowered to the sea bed, when a system of weights and dampers slowly pushes multiple core tubes into the sediment. This allows for a high quality sample of the top layers of sediment to be recovered for analysis. The MUC awaiting deployment under the aft gantry of the RRS James Clark Ross. Photo credit: Carwyn Davies. Having brought the MUC back onboard, and hosed down the copious quantities of mud inevitably now coating the deck, we can move forward, along the starboard side of the ship, to another gantry (The mid-ship gantry). The item most commonly deployed here is the CTD rosette, which measures the Conductivity (which we can use to get salinity), Temperature and Depth (CTD) of the sea water. This sophisticated system is capable of withstanding depths of many thousands of metres, capturing real time temperature data and up to 24 individual water samples. Often, this will be one of the first pieces deployed at a site, providing a profile of the whole water column. 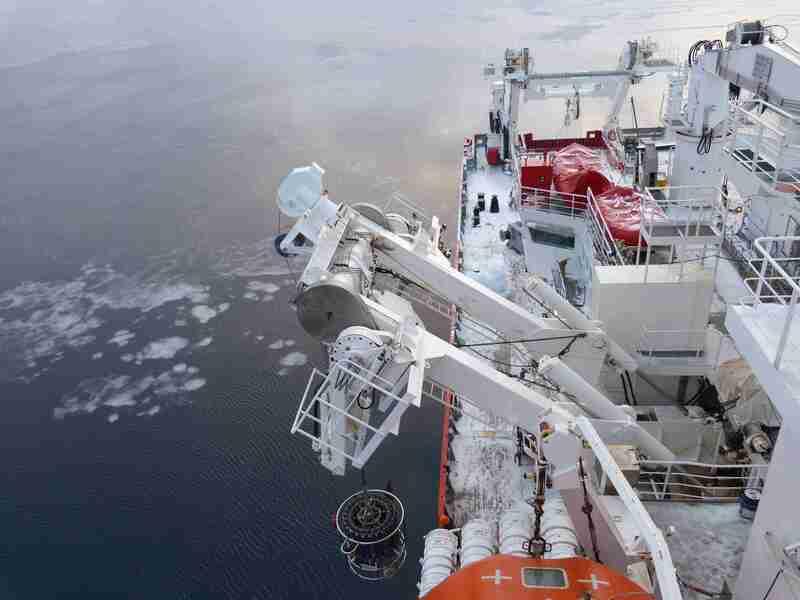 The CTD, which can be used to gather a profile of the water column at a study site, is lowered from the starboard side of the ship. Photo credit: Rowan Whittle. Two other instruments will be deployed from the mid-ship gantry on this specific scientific cruise. The first is a high resolution underwater camera system, designed to capture still images of the sea bed, at various intervals along a ‘transect’ – an imaginary line followed while sampling. The second is a bongo net, a simple upward-facing pair of nets pulled vertically up through the water column to collect small animals. 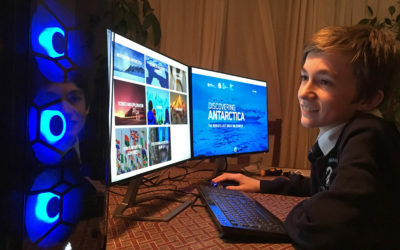 How did you get your job in the Antarctic Marine Engineering team? I began my post with the AME department at British Antarctic Survey in November last year. Although I trained as an Automotive Engineer, I have spent much of my time since university working on motor yachts, and the draw of being able to work at sea in the Antarctic led me to apply for the job. The nature of working with many different items of equipment mean that no two days are ever the same, which can make life interesting at times! Find out more about Engineering at Technology at BAS here or click the banner above to find out about our involvement in the Year of Engineering.